Providing school supplies does not only equip the students to have a stronger start to their year, but it also is a start of a conversation with many parents regarding other areas of instability that they may be experiencing. It will often cost families up to $100 to help get their student ready for school. Through our Back-to-School program, each registered K-12 student receives a new backpack filled with basic, grade-specific school supplies. It is a great joy to watch the children pick out their new backpack and supplies. We love powering a successful start to the school year for these kids! 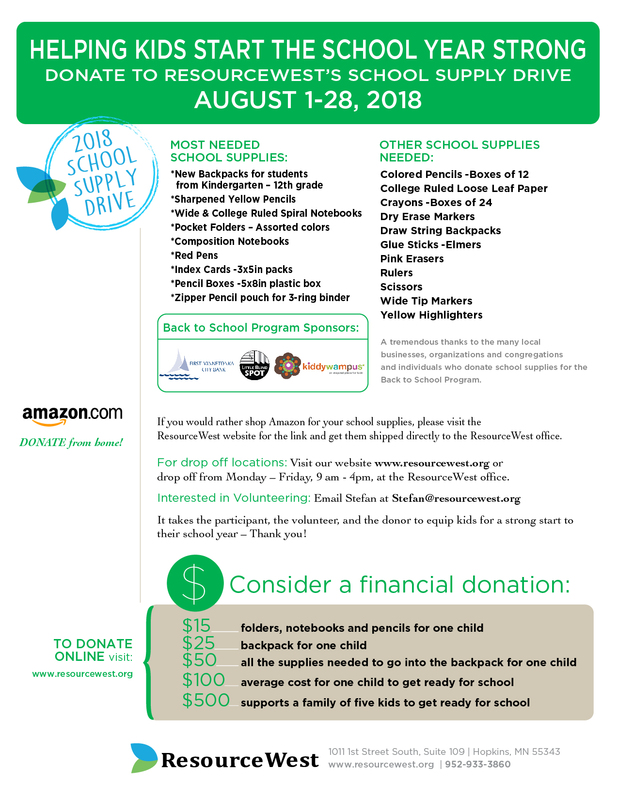 A special thanks to all the wonderful businesses, organizations, and congregations in the Hopkins and Minnetonka community who generously support the Back to School program by hosting corporate collection drives, serving as a public drop site, or donating volunteer time to ResourceWest. Your child(ren) must be students in the Hopkins or Minnetonka School Districts. Your children must be under the age of 18 and registered for school.